There was a particularly large attendance at the monthly Mud Dock meeting in November 1998, with some particularly interesting bikes present. 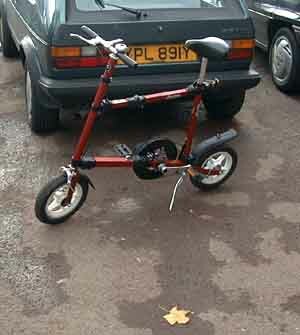 David Henshaw rode the Micro Bike (not to be confused with the Cresswell Micro). This bike is not longer in production, but despite the tiny wheels it does not ride at all badly - those who tried it found it much better than they expected, although obviously more suited to a short commute to and from a railway station rather than more serious riding. More details of the machine can be found on pages 94-96 of "It's in the bag!". Even the back mudguard incorporates a folding (or rather retracting) feature! The most interesting machine present was Steve Parry's much modified Birdy Red. The most radical feature is the conversion to 20" wheels, giving a much better range of tyres. 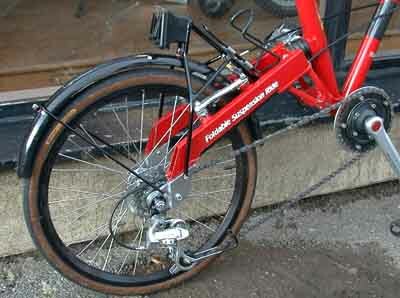 Even on a short test ride the improved rolling resistance was noticeable. 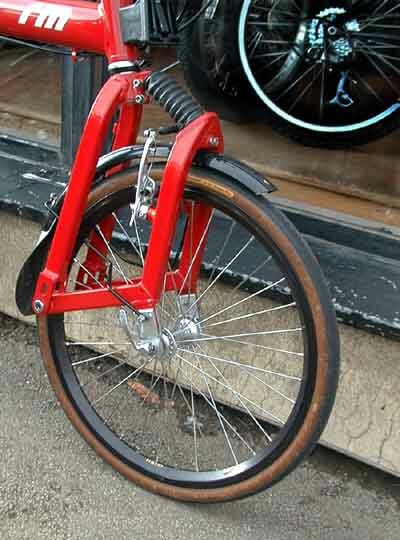 In order to get the 20" wheels in extensions are fitted to the front and rear dropouts. 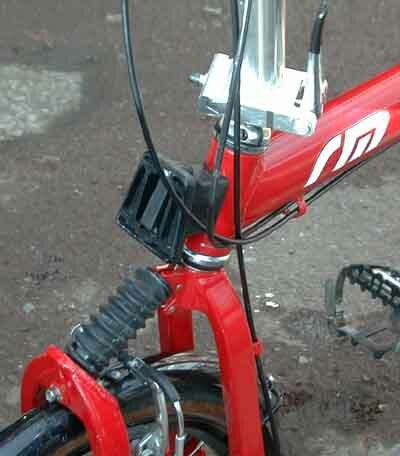 The larger wheels increase the bottom bracket height and step over height. Although one is aware of both these factors in riding the bike, handling does not seem to suffer. Steve's front mounting of the Brompton carrier block on the frame allows a quick release bag to be fitted. However, because the block is fitted by drilling and tapping the aluminium frame, the weight of any bag and carrier should be kept small; Steve himself uses a bag which is of about the height of the Brompton bag, but much narrower. This also avoids the bag getting in the way. 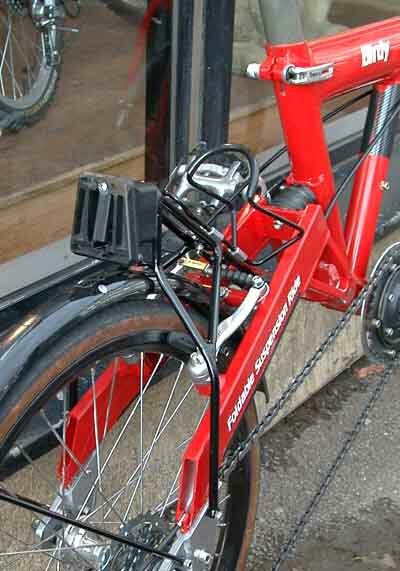 Steve is also thinking of developing a mounting to allow KlickFix mounted bar bags to be attached to the Brompton block. At the rear, Steve has developed a small, very rigidly mounted, carrier, which allows the Brompton block to be counted on it and carry a standard Brompton bag (or other bag with appropriate mounting). There is also very useful provision for a bottle cage - something not allowed for in the basic Birdy. You can also see in the photographs that Steve has fitted a very small chainwheel - this relates to something not as obvious in the pictures - the bike is also fitted with a mountain drive in the bottom bracket. I understand that Steve will be selling at least some of the modifications mentioned here. A report on the modifications is due to appear in A to B magazine at some point - if I can get hold of a copy before then, I will release it on these web pages.